This Pre-Conference Event is fully booked up. Mycoplasma contamination of biopharmaceutical products (also known as biologics or large molecules) resulting from cell culture contamination in the manufacturing process poses a potential health risk to patients. 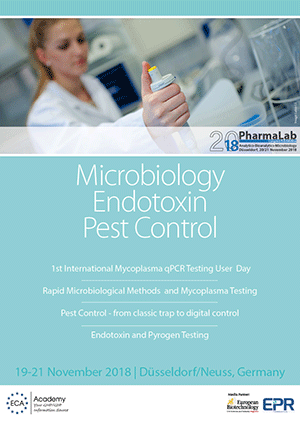 Mycoplasmas can affect virtually every cell culture parameter with often only minor visible effects, creating an uncontrollable environment that is undesirable in the pharmaceutical industry. Therefore, regulatory agencies require manufacturers to test their biopharmaceutical products and to ensure the absence of mycoplasmas in released products. Most regulatory agencies have issued guidelines that provide protocols for mycoplasma testing, and some give recommendations for the validation of rapid NAT (nucleic acid amplification techniques) testing methods. This satellite symposium will give you a scientifically sound introduction into the field of Rapid Mycoplasma testing with a specific focus on NAT and more specifically on qPCR methods. It includes talks, case studies as well as interactive round table discussions from users to users. Rapid Mycoplasma Testing - A revolution for Quality Control? QMS&T Facilitator BioProduction Operations Huningue, France. Head of ASAT Adventitious Agents Testing & Alternative Microbiological Methods, Global Analytical Science & Technology (gASAT), Global QC. International Alliance Manager, Business Development Pharma & Biotech, EMEA LATAM. Click on the image to download the programme as PDF file.